After swooning to The Tourists cover version of “I Only Want To Be With You” and running immediately out to buy its associated album, “Reality Effect,” I had come to discover that it was actually album number two from the feverish power pop band. In fact, three of the numbers on it [“Blind Among The Flowers,” “Fool’s Paradise,” “The Loneliest Man in The World”] I quickly discovered were tunes from the original UK debut album, which, if memory serves, was the first import album I ever bought! The $9.98 price tag was twice what I had paid for “Reality Effect” but after hearing that classic, I literally could not wait to get my hands on more Tourists music! Even on my paltry student budget that meant that it would take more than a week’s “lunch money” to buy that album. The album was full of extremely catchy New Wave power pop songs penned by group leader Peet Coombes. The arrangements were more eclectic than the second album, taking in the Bo Diddley-esque “Can’t Stop Laughing” and even including a dub reggae number this first time out [“Ain’t No Room”]. As with the later album, the ghost of pre-psych mid-60s pop looms large over this record, especially in the Marty Balin-esque vocals proffered by Coombs, sometimes in combination with the dulcet tones of Ms. Annie Lennox for a bracing effect. Another fascinating side trip taken on this album is in the brief but gorgeous acoustic folk number “Another English Day” with Coombs at center stage. Hearing it takes me back to 1965 on a grey Sunday afternoon where everything is in black and white. That tune segues into the last track on side one, the shimmering “Deadly Kiss;” a spotlight for Lennox out in front of Stewart’s spy chord guitar. Americans left with their copy of just “Reality Effect” were really missing out here! The LP version of “The Loneliest Man In The World” still has a Byrds-like 12-string jangle to it but the Conny Plank production is more straightforward and direct, eschewing the heavy drum reverb that Stewart employed to bring the tune closer to Spector-space. 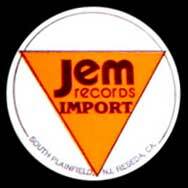 Mention should be given to the creative and sensitive drumming by Jim Toomey throughout the record. This is a highly melodic music, but he finds plenty of spaces for rhythmic fillips throughout the album. Of the rhythm section, he is the dominant force with bassist Eddie Chin only getting a spotlight on the reggae number. One intriguing thing about this album is that three of its songs fail to break the two minute mark. That makes for brisk pacing and gives the proceedings a pleasing urgency. “He Who Laughs Last Laughs Longest” is another brief corker that leaves my ears ready for more. It makes a great lead-in for the ultimate track, “Just Like You.” It’s an ornate number with a guest appearance by “The Touristen Chor of Wolperath.” At just over five minutes, it’s the longest track on the album, but I’ll give them that indulgence for a climactic touch to the proceedings. Lennox’s organ and the keening guitar of Stewart mix magnificently with the vocals as the chorus brings it all to a suitably over the top finish. When remastering this album I saw fit to include the complete complement of non-LP sides by the band throughout their career. They had six tracks, as indicated in red, that were previously relegated to 7″ discs as either A or B-sides. After a critical listening, I think it’s time for a remaster since I have the benefit of better software/hardware, not to mention over a dozen years of experience at denoting. See? Its not just the majors who keep going back to remaster titles. In this case, I won’t be adding any other material, since I like the contents of the disc just fine. 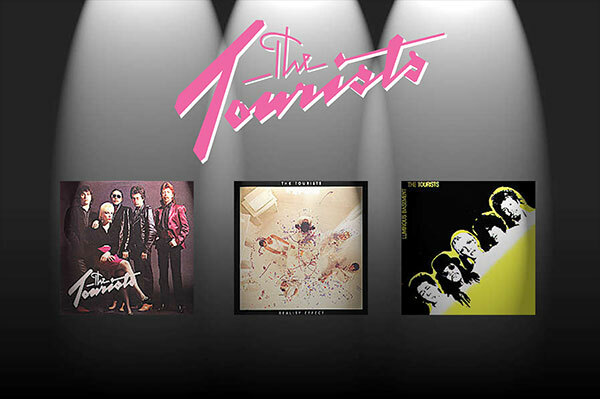 I put the non-LP material on “The Tourists” as bonus tracks and a live BBC transcription disc of a 1980 concert onto my proper remastering of the UK “Reality Effect” as bonus material. Since I have the Japanese CD [the only one!] of “third and final album “Luminous Basement” and it has no bonus material, the three Tourists CDs have everything one would ever want. 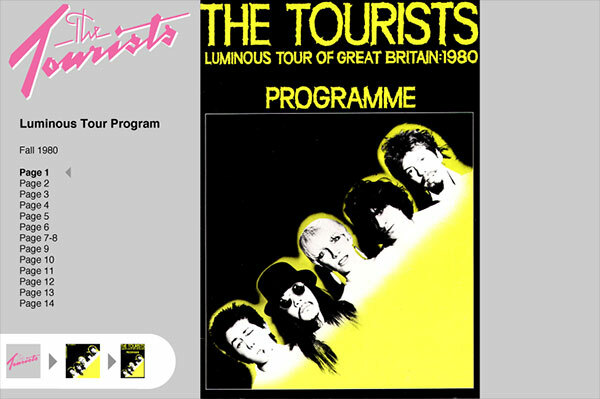 Not forgetting that with plenty of room on the disc, I was able to also include an interactive discography PDF of the complete Tourists UK series of releases. Moreover, the PDF also includes high-res images of the two Tourists tour books I obtained at great expense about 20 years ago as bonus material within bonus material! The books accompany the appropriate pages for “Reality Effect” and “Luminous Basement.” One thing that occurs to me now is that I was working on a 15″ CRT when I made this PDF years and years ago. If I remaster the CD, I should also re-scan the tour books and record sleeves to take them into the modern, a-go-go, retina-display world we now inhabit! This entry was posted in Core Collection, Remastering and tagged Annie Lennox, Dave Stewart, Peet Coombs, The Tourists. Bookmark the permalink. chas_m – Cool your jets, youngster! I just now thought about remastering this. Give me another decade to actually do it!